Researchers identify an oncogene regulated by nutrients. Scientists from the Spanish National Cancer Research Center (CNIO) have discovered that the MCRS1 protein, in response to an excess of nutrients, induces an increase in the activity of mTOR (a mammalian/mechanistic target of Rapamycin); a protein that is altered in human diseases such as cancer and diabetes, processes associated with aging, as well as in certain cardiovascular and neurodegenerative pathologies. The team state that the data findings open up new possibilities for the development of drugs that block MCRS1 to treat cancer and diabetes. The opensource study is published in the journal Developmental Cell. The team explain that under normal conditions, mTOR regulates essential cellular functions, such as protein synthesis and cell growth and proliferation. However, an overactive stimulation of mTOR in response to nutrients and growth factors, metabolic processes that are crucial in tumour biology, leads to an increase in cell growth and proliferation. The researchers have now discovered how the MCRS1 protein, a protein associated with gene regulation and cell death processes, is capable of activating mTOR, and thus, stimulate cell proliferation. In this way, in human colorectal cancer samples, a correlation was found between increased MCRS1 activity and tumours with a high proliferation rate, as well as with a worse prognosis of the disease. The team would like it to be noted that although the current study published results obtained from colorectal samples, they are also studying the relationship between this protein and diseases of the liver, the primary metabolic organ. The incidence of cancer and other related diseases has increased considerably in Western societies; this is partly due to an increased caloric intake and a more sedentary lifestyle. Therefore, unravelling the cellular processes that act in response to an excess of nutrients can contribute to achieve a better understanding of the biology of cancer and, consequently, is key to the fight against this disease, state the researchers. The team plan to continue studying this gene using different genetically modified mouse models, where they can study what occurs when there is a gain- or loss-of-function. The team state they are already obtaining interesting results, but further research is necessary. Ras homolog enriched in brain (Rheb) is critical for mechanistic target of rapamycin complex 1 (mTORC1) activation in response to growth factors and amino acids (AAs). Whereas growth factors inhibit the tuberous sclerosis complex (TSC1-TSC2), a negative Rheb regulator, the role of AAs in Rheb activation remains unknown. Here, we identify microspherule protein 1 (MCRS1) as the essential link between Rheb and mTORC1 activation. MCRS1, in an AA-dependent manner, maintains Rheb at lysosome surfaces, connecting Rheb to mTORC1. MCRS1 suppression in human cancer cells using small interference RNA or mouse embryonic fibroblasts using an inducible-Cre/Lox system reduces mTORC1 activity. MCRS1 depletion promotes Rheb/TSC2 interaction, rendering Rheb inactive and delocalizing it from lysosomes to recycling endocytic vesicles, leading to mTORC1 inactivation. These findings have important implications for signaling mechanisms in various pathologies, including diabetes mellitus and cancer. 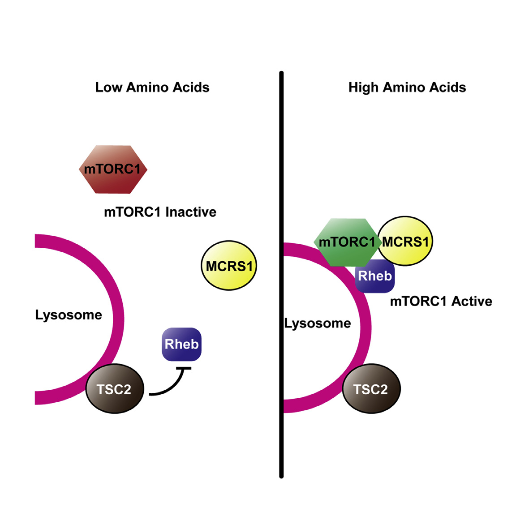 MCRS1 Binds and Couples Rheb to Amino Acid-Dependent mTORC1 Activation. Djouder et al 2015.